Could boat stabilisers spell the end of rock ‘n’ roll? When you live through transformative advances in technology, it’s easy to miss how fast the world around you is shifting – can it really be just five years since Apple launched the first iPad? Pod drives such as Zeus and Volvo Penta IPS probably represent our iPad equivalent, but I reckon there’s another less obvious revolution taking place right now. An increasingly diverse range of ever more sophisticated boat stabilisers and boat control systems (such as high speed interceptors) are creeping into ever smaller boats. And the benefits are game-changing. Part of the momentum is driven by technology, but I think the other reason is that we’ve only just begun to fully value their benefits. Thanks to burgeoning accommodation and weighty luxuries such as hardtops, many of our cruising boats have become taller and more top heavy. Plus, increasing numbers of boaters are now demanding stability and comfort at rest, not just underway. My experience is that even the finest hulls now need a helping hand to please all of the people all of the time. So what are the latest developments, and what are the pros and cons of each? Evidence indeed of a revolution, Seakeeper’s latest gyro is a tiny thing. Weighing 368kg, it takes up less space than a 70 gallon water tank. Or if you aren’t fluent in tank, that’s roughly six HP8600 desktop printers. Its anti-roll software is optimised for sub-50 foot vessels weighing up to 20 tonnes. This means that for the first time cruisers like, say, the Fairline Squadron 48 and Linssen’s Classic Sturdy 46 are able to benefit from gyro stabilisation. Moreover, Seakeeper’s literature talks of vessels of 30 foot and above, so as long as its $29,900 (approx £19,800) cost and its tiny footprint can be accommodated, even smaller motor cruisers will benefit. Like all gyro boat stabilisers, Seakeeper’s 5 has pros and cons. It takes 35 minutes to spool up to 9,035rpm, the point at which it provides stabilisation, and another 15 minutes before it reaches its full 10,700rpm. Compared with instant-on fin boat stabilisers, that’s only going to be a drawback if you’re in a manic rush to put to sea, and surely none of you head off without a safety briefing, a full systems check, and a cup of tea? In my experience gyros are outstanding on a boat at rest or moving at lower speeds, and they don’t increase drag beyond the penalty that a marginal increase in weight incurs. Neither can gyros be damaged by underwater debris or incompetent travel hoist operators. The benefit most often overlooked is noise. Structural considerations notwithstanding, gyros can be positioned almost anywhere, even off-centre according to Seakeeper, although not all the naval architects I’ve talked to are comfortable with that notion. So gyros are far less likely than fins to be sitting under the midships master suite, where hydraulic fins are more prone to disturbing the owner’s reverie with their swooshing. Instead, gyros are likely to be hiding in heavily sound-insulated engine rooms. Compared with gyros, the principal advantage of fins is that, underway, they do not run out of energy. As long as your boat is travelling forward, the angled fins will continue generating a corrective hydrodynamic force. Gyro aficionados like to point out that this force tails off as a boat slows down. True enough, but my hands-on experience suggests that as long as the fins are correctly sized this is not an appreciable problem. Quite differently, a gyro boat stabiliser extracts the precessional energy that it uses to correct heeling by pushing the spinning gyro off its vertical axis. Once the rams involved have reached the full extent of their travel, they can’t extract any more energy until the boat starts to roll in the other direction and the process is reversed. This is principally why gyro manufacturers such as Seakeeper sensibly claim, say, a realistic 70% to 90% roll reduction, not 100%. Gyros from the likes of Veem, Mitsubishi ARG and Seakeeper used to be the only choice for stability at rest, although fins have fought back recently in the form of larger fast-flapping zero-speed versions. 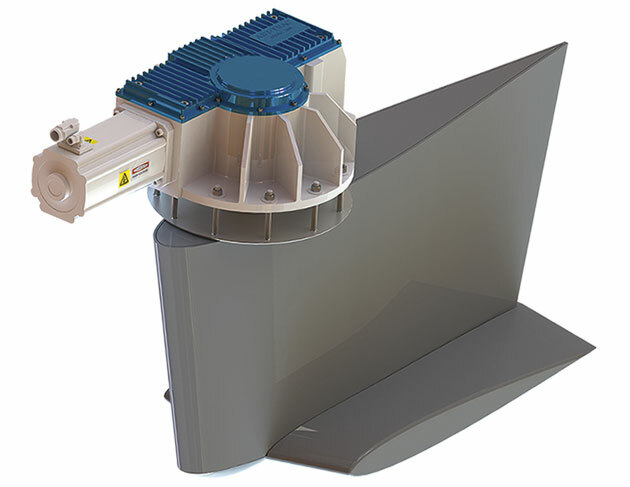 TRAC is countering the hydraulic swooshing by introducing electric motors as alternatives to its usual hydraulic fin actuators, and CMC Marine already has a range of electric fin boat stabilisers. The most radical development in fin-based boat stabilisers is DMS AntiRoll, which we covered fully in the February 2014 issue of MBY. AntiRoll is fundamentally different to existing zero-speed fins in that the high-aspect ratio fins rotate independently around two separate axes. This means that its zero-speed flapping function is far more effective because the whole of the fin’s area is pushing directly against the transverse rolling. It used to be that conventional trim-tabs and their Interceptor siblings were thought of as no more than simple devices to trim the boat. Then along came what is still regarded as the Rolls-Royce of interceptors – the Humphree system. Interceptors will not stop your slow-speed Nordhavn rolling around underway or at rest, as fins or a gyro will, but the latest Humphree HCS5 system is so fast acting (full-up to full-down in less than a second) and so powerful if correctly specified, that on fast boats it can serve as a complete boat attitude control system, including appreciably damping and controlling rolling motions. Zipwake is a newcomer to the Interceptor market. It was nominated for a DAME award at the METS trade show last year, very deservedly so if the prototype system I played with proves as reliable as its terrific design suggests it might. Currently, Zipwake uses its sensors to dynamically control pitch and roll. However, the GPS and 3D gyro sensors and motion controller it uses to do this are integral to its system. So it would only need the necessary algorithms to be developed to provide full attitude control similar to Humphree’s system. The simple interface and control system are nigh on perfect. In auto mode there’s nothing to be done except read the clear display. The manual controls are excellent; a scroll wheel controls the bow-up bow-down running trim while a circular dial handles the lateral trim (heel). It’s far faster and more intuitive than the usual trim-tab controls. At METS, Zipwake was refreshingly free of hyperbole. It does not see itself as a rival for high-end Humphree, instead it is aiming its interceptors at the mass market, so it has standardised its systems and produced four regular sizes of interceptor blade, which can be mixed and matched to provide the necessary muscle. That said, I examined an interceptor that had been disassembled into its component parts, and it was anything but a budget item. It looked as though it would laugh off the 60-knot rating that Zipwake assign. All told, one of the most significant developments in boat control systems that I’ve seen. The end of rock and roll? You may have no choice between fins and gyros when you buy your new boat, although even that seems to be changing. Advances have meant that both principal types – fin and gyro – are improving all the time, so if you are faced with a choice, either on a new boat or a retrofit, nowadays it’s an impressive choice. It could be that two of the seemingly lesser considerations, principally noise and practical installation issues, could tip the balance. However, the overall consensus is still that you cannot beat gyros for stability at rest, but that the best fin-based boat stabilisers cannot generally be bettered underway. And although new systems such as AntiRoll may change that notion, that consensus unfailingly matches my hands-on experience to date. What is potentially exciting is the combination of gyro and high speed interceptor – that’s a marriage which I feel could, on particular boats, give fins a real run for their money in every department. Whichever system suits though, for me the safety issue looms large. Controlling any boat in heavy seas is infinitely easier when it’s not rolling around. And safety at sea definitely improves when you no longer have to abseil across a saloon full of razor-edged furniture.